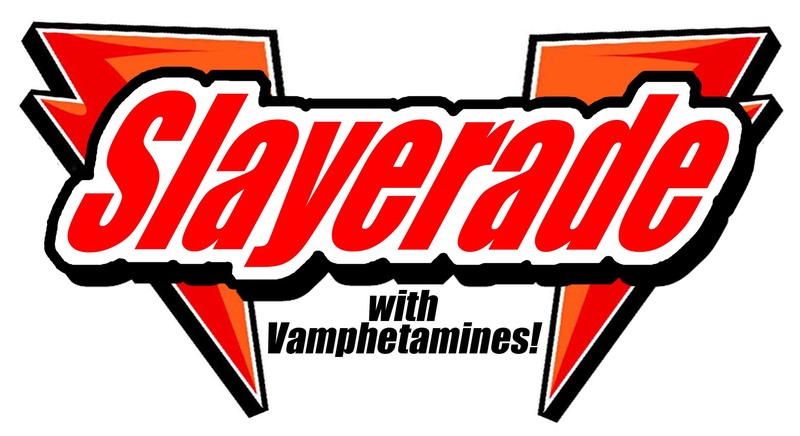 Release your inner slayer with SlayerAde! We put the Amp in Vampire! Side effects cannot be anticipated and may include dizziness, fatigue, headache, nausea, nervousness, anxiety, sleeplessness, drowsiness, vomiting, abdominal pain/cramps, severe allergic reactions (rash, hives, itching, difficulty breathing, tightness in the chest, swelling of the mouth, face, lips, or tongue), chest pain, confusion, difficulty urinating, fainting, fever, chills, flushing, hallucinations, seizures, severe clumsiness, sore throat, unusual bruising or bleeding, fast or irregular heartbeat, memory loss, numbness of an arm or leg, belching, flatulance, explosive diarrhea, painful urination, sexual disfunction, painful or prolonged erection, testicular erosion, ringing in the ears, nosebleed, blurred vision; change in appetite, constipation, dry mouth, ringing in the ears, sun sensitivity, metallic taste in mouth, tremors, enlarged abdomen, skin growths or discoloration, swelling of the hands ankles or feet, swollen glands or veins, suicidal thoughts or behaviors, unexplained change in weight, yellowing of the eyes or skin, night terrors, tumors, disenchantment, speech problems, paranoia, sudden decrease or loss of hearing, uncontrolled muscle movements, leprosy, increased sweating, sudden decrease or loss of vision in one or both eyes, liver and kidney failure, bleeding from the eyes, gout, scurvy, unexpected pregnancy, and spontaneous combustion. CLICK HERE FOR YOUR FREE SAMPLE! !